MOORE, Okla. The tornado that ripped through Moore, Oklahoma near Oklahoma City was as much as a mile wide with winds up to 200 mph. The same suburb was hit hard by a tornado in 1999. That storm had the highest winds ever recorded near the earth's surface. 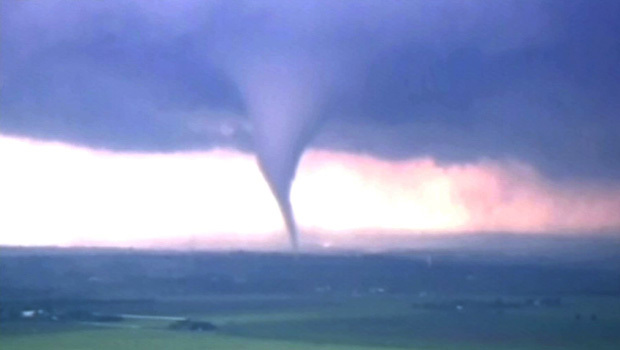 What were the deadliest U. S. tornadoes? The "Tri-state" tornado of 18 March 1925 killed 695 people as it raced along at 60-73 mph in a 219 mile long track across parts of Missouri, Illinois and Indiana, producing F5 damage. The death toll is an estimate based on the work of Grazulis (1993); older references have different counts. This event also holds the known record for most tornado fatalities in a single city or town: at least 234 at Murphysboro IL. The deadliest of the modern era (since 1950) was on 22 May 2011, when a large EF5 tornado crossed Joplin, MO, causing 158 direct fatalities. What was the biggest known tornado? The Hallam, Nebraska F4 tornado of 22 May 2004 is the newest record-holder for peak width, at nearly two and a half miles, as surveyed by Brian Smith of NWS Omaha. This is probably close to the maximum size for tornadoes; but it is possible that larger, unrecorded ones have occurred. What was the strongest tornado? What is the highest wind speed in a tornado? Nobody knows. Tornado wind speeds have only been directly recorded in the weaker ones, because strong and violent tornadoes destroy weather instruments. Mobile Doppler radars such as the OU Doppler on Wheels have remotely sensed tornado wind speeds above ground level as high as about 302 mph (on 3 May 1999 near Bridge Creek OK)--the highest winds ever found near earth's surface by any means. [That tornado caused F5 damage.] But ground-level wind speeds in the most violent tornadoes have never been directly measured.